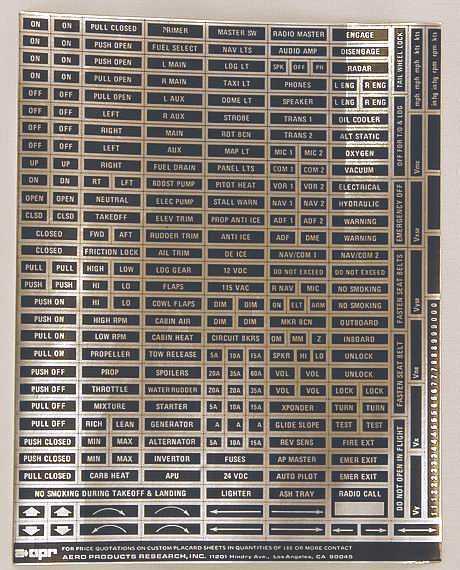 Over 250 pressure-sensitive (stick-on) paper labels for all cockpit switches, circuit breakers, systems, amps, volts, arrows, blanks, numbers, etc. Most common phrases are repeated several times (i.e. On/Off). Sheet measures 8 1/2" x 10 1/2". Just cut and press into place. Review: Too small and shiny. Thought the catalug picture should show the product a bit clearer. Also a lot of plastic covers are dimplede and these stickers tend to come off. Review: The look was very unprofessional. The placards did not remain in place. Will not use again. Am searching for something else.